Softwood decking is a popular, cost-effective outdoor flooring option, but we at TimberTech UK believe that our composite wood decking is an even better choice for your garden. Our decking products look just like traditional timber boards, but they’re more durable and require far less maintenance. 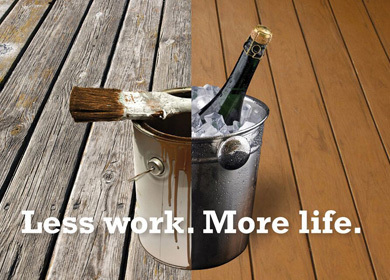 Our decking is also markedly better for the environment! How does softwood decking measure up? The sort of softwood decking that’s available in your local DIY store can be really tricky to install. Building a deck with these materials is very time-consuming, requiring specialist tools and considerable amounts of wasted timber. Since TimberTech decking is made from wood composite – a blend of recycled wood and polymer – there are no knots, meaning that you can use every single bit of it. 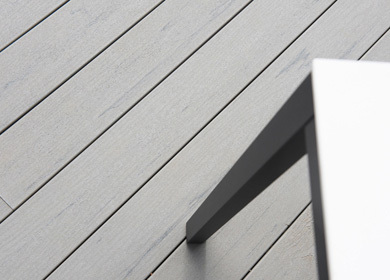 Ours is a decking material that’s truly easy to fit, and with the CONCEALoc® Hidden Fastener System, there’ll be no fixings visible once you’ve finished. Softwood decking can look good to begin with, but you’ll need to spend a lot of time and money to keep it that way going forward. TimberTech’s deck boards, on the other hand, never need sanding, oiling or painting; all they need to stay looking great is a regular sweep and the occasional power wash. Softwood decking will naturally weather when exposed to the great outdoors, and the boards will need regular cleaning and re-staining to avoid this. TimberTech’s decking won’t fade in the sun or warp in the wet weather; it’s also algae-resistant, so you won’t get the build-up of green slime that’s all too common on timber deck boards. Our decking will lighten slightly within the first few months after installation, but from then on, it will retain its colour indefinitely. We even offer a 30-year residential warranty. It’s said that some composite decks can exhibit mould growth, but those that do usually have a high wood content (sometimes as high as 75%). By comparison, TimberTech boards tend to consist of roughly 50% wood; we also include a mould inhibitor during production to further guard against mould. Softwood decking products can easily crack and splinter. They will also become slippery when wet, or when algae begins to build up. Furthermore, if you have children, gaps between the softwood decking boards (which must allow for the timber to expand and contract) can be hazardous for little fingers and toes. TimberTech boards don’t crack, warp or splinter, making them a very safe choice for all the family; our decking is also slip-resistant, algae-resistant, and requires a gap of no more than 3-5mm between boards. The materials that are used to make standard softwood decking are often sourced from forests, and these forests are rapidly disappearing. TimberTech’s products, by contrast, are made using waste wood from the furniture industry, which is made into ‘wood flour’ and combined with polymer to make our composite deck boards. And because they have a 30 year (10 year for commercial installations) warranty, you won’t need to replace them, saving yet more wood from the landfill. Would you like to see and feel the difference for yourself? 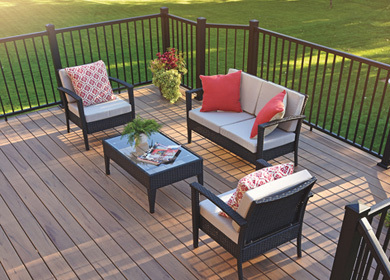 Click here to order a free sample of TimberTech decking.